How do integrators decide which brand of patch panel or keystone jack to buy? 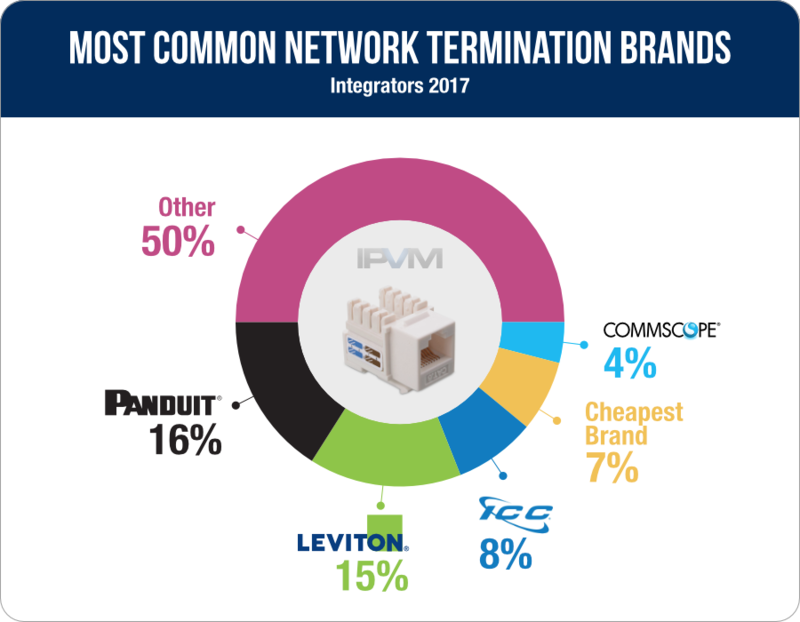 140+ integrators told IPVM which manufacturers they trust and what factors affect their choice of network termination equipment. *** ** *********** ****** ***** ***** ** ***** ***** ** keystone **** ** ***? ***+ *********** **** **** ***** ************* **** ***** *** **** factors ****** ***** ****** ** ******* *********** *********. ***** ******, **** ***'* ********* ** ****** ******* *** ****** though. "******* ** *** ** *** **** ****** ** *** & see ** ******** *****. ** **** ********." "*******, ***** ********, ***** ***********, **********, ********* *** **** ***** everything ** **." "* **** *******. **'* **** *********, *** ***** **** **** a *** ******* ****." "*******, ** ** ** * ****** ********* ******** ********, **** recognized *** ********* ******* ****** **********, *** *** ** ******* at **** ******." "*******. **** *** ********* ** *********, ** ** **** *** them ** ********." "*******- *** ***** *** ********* *** ****** **** *********." "*******. ** ** *** ** *** **** *** ** ******* rebates." "*******. ***** ******** *** **** ********." "**** ***** *******. ** ********* *** ******* ** ***** ***** and ******** ** ***** *****. ** *** ***** ****-*** ******, Category ** *** *****. ********* *******." "*******. ******* ******** **** ***** ***** ** ***** ****." ** ********, *********** **** ** **** **** *** ***** ******* them ** *** ******** ****** *** *** ******** ***** *** patch ******. "******* ****** ** ***** **** *** ** *** *********." "** ******* ****** **** **** ** *****." "****'* **** ** ***** ******** *******." "** ** ******* ********* ******* **** * ****** ** *********." "** **** ** **** *** *** *** *** *****." "*** ***** ****'* ******** ******* *** ********* **** *** ***** sources." "*** *** *** **** ********." "** ** ******** ** *** ******* **********." "******* ** ** ******** *********." *** **** **** ****** ****** ***** *** ***** * ******** brand, ** *** ***** ** ***** ** ***, ** *****. "***** * ********* **** ****** ** ** **** ********* ***** in *****." "**'* * ******* ******* ** * ****** *****." "********** *** *********** ** * **** ********** ****." "* **** *** **** *******." "** ***** ** **********, **** ******* (** ******, ** ****** to ****** ** * **** *****)." "**** ******* *** **** ** ***." "**** ******* *** ********* **** *********." "** ***'* **** * ** ** *****, ** ** ******* what ** ** ****." **** *********** ***** ***** ********* ************ **** * ********** *****'* quality ** * ****** ** ********** ** *** **** *****'* products. "**'** *** * *** **** *** ** ******** ** ******." "***** **** **** * *** ******* ****." "***** ******** *** **** ********." "*** ******* ** ***** ***** *** ******** ** ***** *****." "******* ******** **** ***** ***** ** ***** ****." "**** **** **** *** *** **** *******." "* **** **** **** ******** *******." "**** * ******* ***** *** ********." "**** ** *** ***** ***** *** * *******." "*** **** ****** *** ** ** ***** ** ***...*****." **** ** *** ********** **** ****** ************ *****, ***** ***** to ***** ******* ************ *****, ******* *********** ** ****** ******** based ** *** ****** **** **** ***** *********** *** ******* them. *******, ***** *** ** ********* ** ***** ***** ******** ** the ******** ** ***, ********** **** **** ** *** *** be * ****** ** ******** **********. "**** ****** *** * *** ******** **** **** ** ********* easy ** ********* *** *** ********* ****** *** *** **** on ** **** ********* ** *** ***." "******* **** ********* ******* ***** ***** ****** **** **** ****." "**** ** ********* **** *** ***** *** ** ****** ********* onto ***** ****** ** *****." "***** *** **** ** ***." "***** *** ******** **** *********** *** **** **** ******* ******* crossover ******** ****** *********." "****** *** ******** *******. ***** ** ***** ** ************." "******** ***** ****** - **** ** ********* ****." "* **** ** ************ ******* ****'** ***********, **** ** *******, and ****." "******* - *********** *** **** ** ***." "***. ******* ****** *** ****** ************ ********." **** *********** **** ** **** **** **** ******* *** ***** brands ** ** ****. "*** ******* ** *** ******* ** **** **** ********* **** want ** ** ***." "******* *** **** ****. **** ********* *** **** ****** *** written **** *****." "********* *** ** ***** **** ******** ******* *** ******." "** ***** ** ******* *** "*** ** ***" ************ ******** by *** ********** ***** *****, *** ***** ***** **** ** certified ** *** ******* ********. **, *** *** **** ****, we *** ***** ** ***** ********, ****** *** ******** *** a ******** ******* ** ****** **********." *'** **** ****** **** ****** **** *** ****** ********-***-***-***** ****. The ***** ******** ***** ****** ****** ** **** ****** ******* of *** ****** **** ***. * **** *** ** **-***** almost * */* ** ***** ** ***** ********* ** * call ****** **** **** * ****** ****** ****. *********** **** ********* ***'* **** *********. ** *** ********** ** industry **** *** ****** ********** *** **** ********, *** **** for ***** ****** *** ******** ***** ***********. ******* **** ***** ***** *** *** *** ** *** *** the ***** **** (****** **** ********) *** **** *** *** the ***** ***** *** *** ** * ****** *** *** >50% ******* ** ************* *******:-( *** **** ** * ********** office ******* *** **** **** *** **** ******, ******* *** could **-***** *** *** ****** "*******" *** ** *** ***** it **** * ******* *************. **** ********. ** * ***** ** ****, ******** *** ***** by * *** ** *** *********** ** *** ****** ** they **** *** ********** **** *** *** ** was *** ****** ********** ** ******* ****. ******* *** **** ** ***** ****** ******* ** ** *** testing ** *** ** ***** *******? ********** *** **** ******** for ****** ** *** ****. **** ***** ** ******* ** *** ********* ** ** ******** cable ******** (****, ***** *******/********** ****, **** *************, ***.)? ***? ****** ** *** ***** ******* **** ****. ** *** *** ***** **** ** *** ** ********* **** of *** ****** ***** **** ***** ****** ** *** ***** around *** **** ***** *** **** **** **** *********. ** stopped ***** **** ** ******* *** ****** *** ** *** same ****, ** **** *** ** ****** **** ***** *** patch ****** ** *** *****. * ***** *** ****** **** ** ***** *** **** ****** "reaching *** *** ****** ** *** ****" ** *******... ******* a **** *** ** ****** **** ******-***** *** ****'* ***** it. * **** ** ***** ** **** **** *** ***** **** installing *******. ***** ******** **** *** *** ***** ***** ** CAT5e ****, ***** ******** ********** *** ******* ** ****** ****** not ** ***** ******* ** **** **** *** ****** ***** up *** *** *** *** * ***** ****** *** ** it, ****** ** ******* **** **** ***** *** ******** ** another ******** ********.